Precut pads keep objects from sliding or rolling. This non-slip material grips on both sides to secure objects, yet peels off surfaces easily. Use on trays and tables to keep plates and cutlery from sliding or pens and pencils from rolling off tabletops. Ideal for adhering cushions and inserts to wheelchairs. 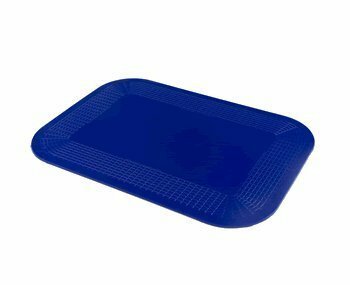 The largest rectangular pad is great for lining lap trays. Dycem® is non-toxic and can be cleaned with soapy water to retain its properties. It is not effective when wet and must dry before use. Precut rectangles are available in blue and red. Also available in Round precut Pads, Rolls, and Self-adhesive Strips and Sheets.